Find out what WVLS Library advocates were talking about at the Capitol on February 21st and how local library stories matter to the ongoing effort to secure state library aid during the 2017-2019 budget process. Library Legislative Day was sponsored by the Wisconsin Library Association at the Capitol in Madison on February 21st. Representing WVLS were librarians Mary Dunn (Tomahawk Public Library), Ralph Illick (Marathon County Public Library), Virginia Roberts and Sarah Steinbacher (Rhinelander District Library); WVLS Trustees Eileen Grunseth (Taylor County), Louise Olszewski (Clark County), and Mike Otten (Marathon County); WVLS staff members Anne Hamland, Chris Heitman and Kris Adams Wendt. Following a morning briefing, the WVLS team split up to cover 30 minute appointments with the three State Senators and eight Assembly Representatives whose districts include portions of our seven WVLS counties. Legislators received copies of the Wisconsin Library Association 2017-2019 State Budget Priorities from library advocates who used the WLA Building Relationships, Partnering for Progress briefing paper for background. What comes next in the state budget drafting process currently underway? Senator Tom Tiffany (12th Senate District including Forest, Langlade, Lincoln and Oneida Counties) and Representative Mary (Czaja) Felzkowski (35th Assembly District including Langlade, Lincoln, and part of Oneida Counties) are both members of the powerful Joint Finance Committee that holds hearings on the Governor’s budget proposal starting in March and makes changes for legislative review before it lands back on the Governor’s desk in June. Cost to continue funding to maintain core state library services-BadgerLink, Library Service Contracts and Newsline for the Blind. The Governor’s budget proposal maintained public library system aids at the same level since 2012. No cuts, no increase. However, the Governor did agree to maintain core state library services at the requested level. The buget proposals next go to review before the Joint Finance Committee. See “How you can help” and “Telling the Library Story” on the Building Relationships, Partnering for Progress briefing paper linked above. Your library stories matter! State funding enables local citizens to access library resources and services that local libraries cannot afford on their own. Legislators and Librarians share the same community constituents! Please take a few minutes to drop your State Senator and Assembly Represenative a note on library letterhead expressing your regret at not being able to attend this year’s Library Legislative Day. Then add a “me too” message supporting the two proposals above linking why they are important to examples from your local library experience. Which Legislators represent what libraries? Find contact information for your Legislators in the WVLS Libraries and Legislators by County contact resource. Contact Kris Adams Wendt kawendt@wvls.org with questions or for further information. 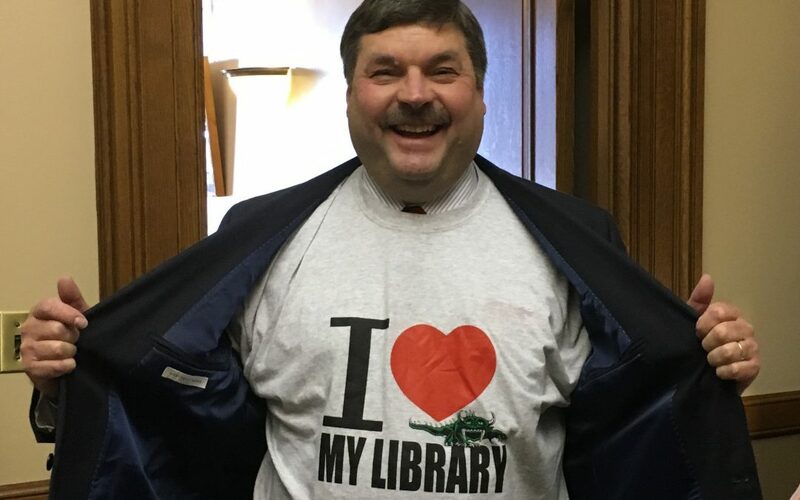 Representative Rob Swearingen wore his I Love MY Hodag Library shirt. Pictured from left are Sarah Steinbacher and Virginia Roberts of the Rhinelander District Library, Kris Adams Wendt of WVLS, and Mary Dunn of Tomahawk Public Library. Pictured from left are Ralph Illick of the Marathon County Public Library, Representative Robert Kulp, Chris Heitman and Anne Hamland of WVLS, Eileen Grunseth and Louise Olszweski, WVLS Trustees from Taylor and Clark Counties. Pictured from left are Sarah Steinbacher of Rhinelander District Library, Mary Dunn of Tomahawk Public Library, Virginia Roberts of Rhinelander District Library, and Senator Tom Tiffany. Pictured from left are Mike Otten Marathon County WVLS Trustee, WVLS Staff Chris Heitman and Anne Hamland, Representative Pat Snyder, and Ralph Illick of Marathon County Public Library.